evoted to his preparations, Father Antonio Molinari weathered the bumps and sways of a moving coach while attempting to decipher the rather rushed handwriting of Pope Pius IX. The task would’ve been daunting even in stationary surroundings and without the horrors of Vienna still fresh in his mind. Whenever he closed his eyes to sleep, he found himself surrounded by it again: the chill upon his back, the smell of death, and the sound of fear―a pounding heartbeat in his head. 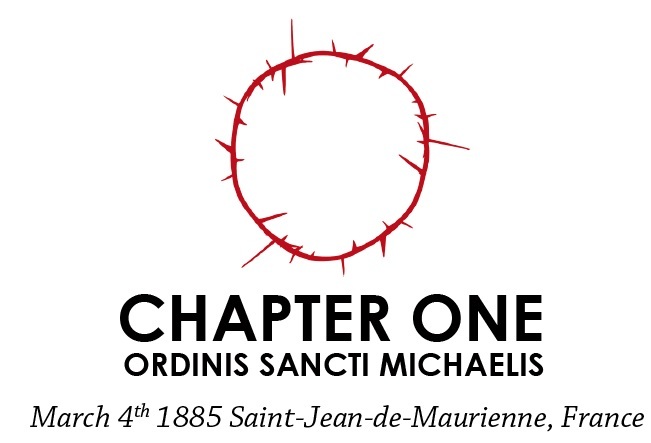 His work for the Order of Saint Michael brought him face to face with sights that defied the science of mankind to explain, and the soul to withstand. When he could no longer tolerate staring at blurry smears masquerading as words, he wiped at his eyes and sighed. Crumbled bits of red and white wax flaked onto his black pants as he rearranged the pile of missives in his lap, a modest parcel of cloth in the facing seat his only traveling companion. Warm air streaming through the window carried the scent of meadow grass and pollen. He grasped the red-padded wall when the wheels hit a rough patch. Two lanterns hanging outside the carriage swayed and thumped against the sides. His surroundings pitched and rocked, and the tall grass rushed by, dotted here and there by white sheep and goats. Two teenaged boys and a dog attempted to keep them grouped; the sheep seemed compliant, but the goats went wherever they pleased. Once the road smoothed, he settled against the plush bench and spread open the letters. The topmost, he had already read four times. A man, Henri Baudin, claimed his daughter suffered the harrowing of Satan. His words were terse, earnest, and packed with desperation. The condition of the paper, worn and refolded, supported the story it had been passed through many hands. Beneath it laid two replies from local clergy to an inquiry Father Molinari had sent in response to the man’s request. The first, penned by a Father Michaud, claimed the young woman appeared normal to him, and showed little sign of external influence. A deacon from an outlying chapel also wrote to say he believed the woman was only seeking attention. While no one claimed to have witnessed any arguments, the deacon believed she wished to delay or avoid an imminent wedding. Somehow, the case had been elevated to a bishop who had seen fit to refer it to Molinari’s immediate superior, Cardinal Benedetto. He’d barely set his bundle down in his room before the summons came. “No rest for the wicked… or the righteous.” He rubbed fatigue from the bridge of his nose, offering a halfhearted smile at his belongings, as if the lump might answer. He could learn nothing new from the letters, and tucked the papers into his sacred book. The pope had gotten wind of what happened in Vienna and, at least from what he had been able to discern from the overly fancy writing, wanted assurances he had dispatched the creature back to Hell. It had little bearing on the reason for his current journey, and could at least wait until he had the luxury of a solid chair and a table bereft of bouncing. The wagon lurched forward and right, forcing him to grab the seat to avoid tumbling off. He reclined, braced his arm against the wall, and closed his eyes until a sharp forward lurch snapped him from his brief rest. Outside, horses nickered and shifted. The coach had stopped a few paces from the front of a sizeable but not extravagant house. He stretched, grabbed his book, and reached for the door. The driver opened it from the outside before he could touch it. Father Molinari eyed the front door, plain and brown like most of the façade. Gnarled wood pillars blotched with dark stains and flaking white paint supported the roof overhanging the porch. Walls of stacked stone seemed at peace with the environs, as though the house had always been here. He lost a few seconds studying a thread of moss growing in the cracks, entertaining the momentary hope that Satan surely could not have influenced such a pastoral place. Perhaps, as in the claim of stigmata in Luxembourg, this would also prove false. An older man in a loose white shirt appeared in the doorway, skin darkened from many days in the sun. He ambled out to the edge of the porch wearing an expectant look. “What have you learned from the locals along the way?” Father Molinari tucked the book under his arm and headed to the house. “That is strange, Father?” asked Paolo. He stepped through the foyer to a family room of white plaster walls and humble furnishings. Amateur oil paintings of the surrounding countryside lent touches of green, orange, and yellow to the otherwise earth-toned dwelling. Thick, dark-stained wood trusses across the ceiling seemed to shrink the room, invoking an urge to duck his head. The scent of dried flowers mingled with another odd, earthy fragrance he couldn’t quite place right away. Henri gestured to a padded chair and took the metal one beside it. Once Molinari sat, Henri leaned forward, elbows to his knees, and spoke in a somber half-whisper. “Oh?” Molinari eyed the dark beams overhead and the numerous small oil paintings of nature scenes. Father Molinari stood. He shifted around to face behind him, but grasped the chair at an onrush of sudden vertigo. The distant wide arch wavered and pulled away. He blinked and shook his head; when he opened his eyes, everything appeared normal. “Father, are you all right?” Henri grasped his arm as if to keep him from fainting. Five strides brought him to an archway twelve feet wide, separating the front room from a secluded area filled with sunlight and eight easels. Two held blank canvases, the rest paintings of fields, flowers, and a river in various stages of completion. Red spots on the floor by one of the easels resembled blood, though looked more like the castoff from reckless strokes. A thin, barefoot girl with thick jet hair down to her waist laced through with green ribbons stood with her back turned. Paint smears adorned the sleeves of her plain white dress, which looked on the threadbare side. She held a wooden palette in her left hand, a brush in her right, and flitted over the canvas like an excited sprite, dabbing bright green paint onto the scene of a meadow. Molinari stilled, watching her. She made triumphant grunts and happy squeaks, with the occasional ‘a-ha’ or giggle when paint seemed to strike the canvas in a way that pleased her. A number of older canvases, half covered by grey cloth, lay on the floor against the wall at the far end. They appeared to be attempts at portraits, all of the same middle-aged woman, though her impressionistic techniques that lent themselves to the landscapes did not translate well to the human figure. Based on the lack of portraits in the house, and the attempt to cover these, he assumed she considered them failures. “My dear, there is someone to see you,” said Henri behind him. Henri stifled a gurgle and made an apologetic face. Father Molinari raised an eyebrow. The crisscross lace up the front of her dress hung open enough to expose a little skin, also daubed with paint. Her emphatic work left her breathing hard, and the way she’d angled herself gave him a clear view of her cleavage. That the area between her breasts was as tan as the rest of her caused him to shift with awkward discomfort. He snapped his gaze up to her wide brown eyes. She grinned. “The painting?” Josephine tilted her head, nothing but innocence in her eyes. “Non.” She giggled and spun about. “Usually, I paint what is outside here, but today I let my imagination go.” Josephine gasped with sudden inspiration and dabbed in a small, plain building at the other end of a garden opposite the church. The same wobbly sense of vertigo came over him as he stared at the painting. Father Molinari furrowed his eyebrows. This girl struck him as exuberant, animated, and a little odd. Not at all like the somber creature Henri had described. Never mind her continued use of ‘Henri’ to address her father, or her utter disregard for his title. It again made no sense to him how the letter could’ve made it to Cardinal Benedetto’s desk. Aside from the brash impropriety of youth, she seemed fine. Hmm. Odd. She did not insist I stay for dinner. It is only polite to decline at first. Both men turned their heads, following the dainty sprite as she all but skipped out of the studio and vanished into an inner hallway. Molinari paced about the easels. It did seem strange that she failed to finish so many… or started one on a whim as if taken by a random muse. As his gaze swept over the stack of paintings against the wall, the dizziness came on again—enough to cause a swoon, which Henri caught. Henri shrugged. “Perhaps Olivie, but it could be any woman with brown hair. The features are…” The man waved his hand about as if trying to pluck a word from the air. He took a knee and pulled the canvases forward before extracting the one, which seemed to have been placed in the back to hide it. Henri gasped as it came into view. The painting depicted a garden fountain surrounded by dark crimson roses. A beautiful woman well into her forties stood before the basin, arms extended in welcome. She wore a black dress one might expect to see at a funeral, and her smile held as much sadness as joy. At her feet lay the bloodstained body of a young man, stabbed in the chest and with his heart removed, dropped on the ground at his side like so much offal. Two male infants, both their throats cut, had been posed in his arms in a mockery of paternal cradling. Josephine knelt beside him, gazing up at the woman with a worshipful expression. She held a gleaming dagger in both hands, which she appeared about to thrust into her own chest. No sane student of art would imagine the same hand created this piece as everything else here. What he held could stand against the great masters, so realistic the fabric sprang from the canvas. He glanced back at the red spatters on the floor, which matched the horrible gore at the bottom. He tucked the painting out of sight as soft footfalls scuffed outside, and flipped the cloth back in place not a second before Josephine, now in a much newer-looking green dress, poked her head in and smiled. After a meaningful look to Henri, he followed her out onto the back porch and down a few steps to grassy meadow. Perhaps a hundred yards away, a creek cut through the green. Josephine headed toward a tiny wooden shack on the bank. He held back a pang of doubt. True, if he had any regrets in his life, it was that. “I have nothing to be guilty for.” He tried not to hear the grumbles of his mother, lamenting being denied grandchildren. Father Molinari stood in stunned silence for a few seconds as she skipped off in the direction of the house. He hurried up behind her. He stared at her, unable to think of anything to say before she resumed walking to the house. He followed, eyebrows furrowed together, mulling her words. How does this girl know these things? My mother’s fondness for wine… my―he gazed at the clouds―forgive me, Father, pride. He resolved to confess to Cardinal Benedetto as soon as he could. The young woman before him was right. He had been prideful. Surely, he could allow himself a little glory? He had done God’s will. He had destroyed an abomination. He had been called to serve. Father Molinari narrowed his eyes. She seemed to know him too well… the lack of courtesy… the painting… she didn’t want him to stay for dinner. In fact, she appeared quite eager for him to depart. Josephine stopped at the steps to the porch. “I did not think it possible, but that dark look upon your brow has made you even more handsome. You should go to town before I become unable to keep my promise to Marcel.” A playful wink hinted at exaggeration. “Or do you wish to be in your own bed as soon as possible? Really, you should not worry about me. My mother cannot wait to see my sons.” She beamed. “Oui?” She paused with one foot on a step. “May I see your hand a moment?” He secreted a phial of holy water from his pocket. “What, now you are a mystic reading life lines?” She giggled. Father Molinari poured a bit of water into her hand. In an instant, her skin reddened and bubbled to a blister. Josephine dropped the lamb, shrieked at the top of her lungs, and shoved him away. He flailed his arms, unprepared for the strength behind the little woman that flung him airborne. He crashed into an array of boxes and tools propped against the porch railing, dragging most to the ground with him. Not until his gaze fell upon a streak of dark crimson did the lance of pain searing through his flesh reach his consciousness. Father Molinari stared in horror at a three-inch rake tine protruding through the back of his hand. He gasped. The soft thuds of her running fell silent. “Josephine, what has―” Henri yelped as if he too was shoved aside. Father Molinari wheezed through his teeth and shifted his weight to his knees. He grasped the rake and worked his hand up the iron spike; every muscle in his back locked at the sensation of it grating through flesh and scraping across the bones inside his palm. Henri helped him up and brought him to the pump where they washed his hand. After wrapping the wound in linen strips, Father Molinari made his way to the coach, past a snoozing Paolo on the front porch. He rifled through his belongings, collecting a purple stole with two crosses in gold trim, his sacred book, and a large eight-inch crucifix amulet. He returned to the house, where Henri waited at the bottom of a stairway to the second floor. Molinari followed the man up to a narrow hallway with a curved ceiling that ran the length of the house. He halted at the top and braced his hand to the wall to fend off another, stronger, pall of vertigo. The narrow corridor seemed to twist, as if the far end drifted away, walls stretching. Blur obscured the ceiling as paintings darkened. A small vase perched on a sky blue table along the right side felt as though it watched him. Dryness parched his throat, and trickles of sweat slipped down from his armpits. He steeled his mind against the disorienting spin, remaining still until the hall shifted back to rights. Both men jumped at a heavy slam from behind the door. Father Molinari grasped the knob and flung the door open. Josephine sat on a cushioned bench on the far side of the room, back turned, running a brush through her long, black hair. She looked over with a curious expression, as though nothing unusual at all had occurred. Her hand still bore the red burn where the water had touched, the only thing that made Molinari not feel like he’d talked himself into giving purpose to his visit. Josephine let out a soft huff and continued brushing her hair. Blood oozed from the wound, trickling down Father Molinari’s arm as he raised the book and launched into a recitation using a voice a touch short of a shout. He caught a glimpse of unease in her expression. Fear. He advanced, letting the crucifix dangle on its chain, and produced the holy water flask from his pocket. He eyed the door, which Henri moved in front of. Molinari took another step forward and used his thumb to turn the flask into a sprayer as he flung it back and forth, repeating his chant. Josephine screamed as though he pelted her with boiling oil. She hurled her brush at him, which missed, and crossed her arms over her face. He continued spraying and chanting, raising his voice to shout over her wails. “Begone, unclean spirit!” He returned the flask to his pocket and held up the crucifix. He held the crucifix higher and drew a breath to repeat the invocation. A small mirror leapt off the bureau behind her and smashed across his forehead. He staggered back into Henri’s arms, dazed from the hit. Josephine cackled. The hairbrush floated off the ground and hurled itself at him from behind, striking him between the shoulder blades. He let out an oof and fell to one knee. Small statues, music boxes, and three paintings launched themselves at random while Josephine alternated between the giggles of a child, a young woman, and the deep laughter of a man. Father Molinari let the crucifix drape against his chest and clutched his book in both hands, trying to shield his face from the onslaught. A great invisible force smashed into Father Molinari, flinging him out into the hallway. Henri landed next to him on his back, legs in the air. A second later, the door slammed hard enough to crack the plaster around it. “Josephine!” yelled Henri, clambering to his feet. He bumped the door again. Josephine shouted something else in Romanian that sounded decidedly less polite. Henri gave him a nod, and the two men charged the door at the same time. It gave under their combined strength, and they stumbled in. Josephine hung in the air, extending her arms up to the side. The tilt of her head mocked the crucifixion. She laughed. Two windows, one on either side of her, exploded inward in a torrent of glass needles. Molinari ducked, letting off a wail of pain as a dagger shard stabbed through the rake wound, pinning his hand to the sacred book. He looked up after the rain of glass subsided. Henri grasped the piece of glass and pulled it loose. Molinari winced, but nodded his thanks. Both of Josephine’s eyes had gone black from corner to corner, and her gaping mouth held a cloud of ebon vapor. “Unclean spirit, I command you,” yelled Father Molinari. “She is mine. She gave herself to me willingly.” The same man’s voice, deeper still, echoed from the mouth of the girl. “Christ, have mercy,” said Henri. “O God the Father of heaven,” said Molinari. “Have mercy upon us,” said Henri. “Have mercy upon us,” whispered Henri. “Pray for us,” said Henri. “Holy Mother of God,” said Molinari. “Pray for us,” repeated Henri. Josephine wailed, gliding around in the air in an effort to evade the relentless spray. Father Molinari recited the Litany of Saints, grateful for Henri responding where he knew, but continuing despite the gaps when the man’s reply was a guess. With each saintly name, Josephine’s wails intensified, alternating between anger and taunting laughter. Henri put himself in the path of several books launched at Molinari. After a second recitation, Josephine ceased floating and collapsed to her knees, slumped forward as if inebriated beyond coherence. Father Molinari advanced and placed his hand on her forehead. Josephine went limp, a tendril of drool hanging from her lower lip. She gurgled. Two crucifixes on the walls―the only items in the room that hadn’t flown about―scratched as they rotated, inverting themselves. Henri trembled. Furniture downstairs rumbled, as if every chair, table, and bureau in the entire house jumped up and down in place. Josephine flopped over sideways, sprawled on the rug. She lay as if dead for a few seconds, and burst into normal-sounding tears. Henri looked up with hope in his eyes. Molinari shook his head. The upended crucifixes whirled about on their nails, racing clock hands. Dread gathered like a leaden weight in his stomach. Something unnatural had entered this house. The reek of hundreds of bad eggs washed over the room. Henri gagged; Father Molinari’s eyes watered from the awfulness of it. He palmed the young woman’s listless head, and repeated his invocation, commanding the spirit out in the names of God, Jesus, the Holy Spirit, and all the saints in turn. Josephine’s back arched. She coughed and sputtered as if drowning. Thick, black liquid splashed up and out of her mouth. It splattered on her dress, but then exuded as a vapor into the air. The vestige of a human face with horns and glistening glass-like teeth manifested at the top of the cloud, gazing at Molinari with sheer hatred. It receded from the crucifix in his hand, and rushed off to the corner, where it cowered against the wall. Henri quivered, pale as a corpse. Josephine appeared to have fainted. Molinari advanced on the black fiend. It rose up to a height of nine feet, baring claws and hissing. Father Molinari stood his ground, confident that God would protect him. He raised the crucifix. The shadow entity collapsed inward, emitting a howl of anger as it melted into a cloud that seeped into the floorboards. Seconds later, the house seemed… different. More youthful. Cleaner. Father Molinari slouched, again grimacing as the wicked pain in his hand flared. “My daughter.” Henri fell to his knees and gathered Josephine in his arms. Father Molinari approached and poured holy water over the back of her hand. It ran without effect over her skin and dribbled to the floor. He smiled and offered Henri a comforting nod. The coachman bowed and made the sign of the cross. “Worry no more of it,” said Henri. Henri helped Josephine to her feet. He let himself out as Henri tended to his daughter. Once Molinari reached the porch, he took a great breath of sweet, fresh air. Paolo met him at the steps and followed him to the coach.